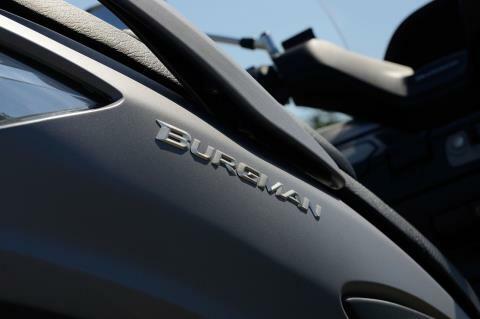 The Burgman 400 ABS* features aerodynamic styling matched by exciting performance. 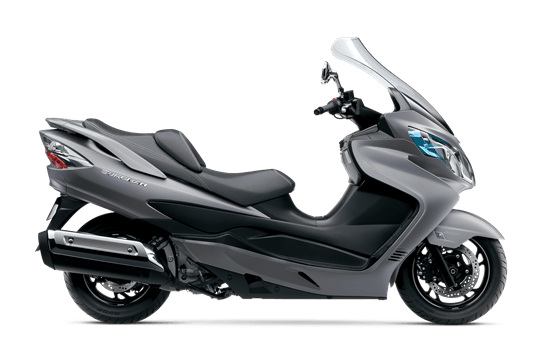 Its liquid-cooled engine with advanced fuel injection system delivers strong acceleration, while an automatic clutch, V-belt primary and shaft final drive provides smooth power delivery. 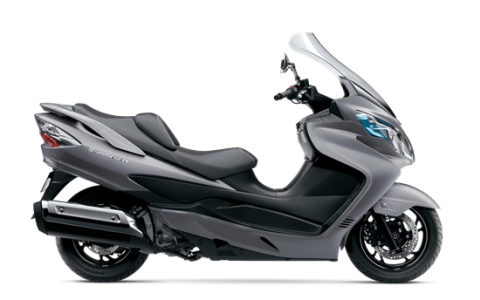 For comfort around town or on the highway, it has plush suspension, a stepped seat and an easily adjustable backrest for the rider. It also features a huge storage compartment large enough for two full-face helmets. Strong, large-diameter steel frame uses thin-wall technology to produce an exceptionally strong, yet lightweight chassis. Telescopic 41 mm inner-tube front forks with a generous 4.3 in. 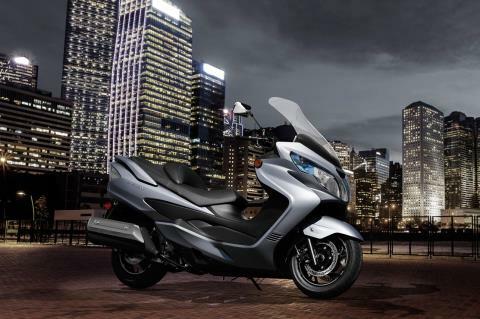 of wheel travel, and link-type mono shock absorber rear suspension has adjustable preload. The overall benefits are motorcycle levels of handling with exceptional maneuverability. The 14 in. front wheel carries 260 mm hydraulic dual disc brake, and 13 in. 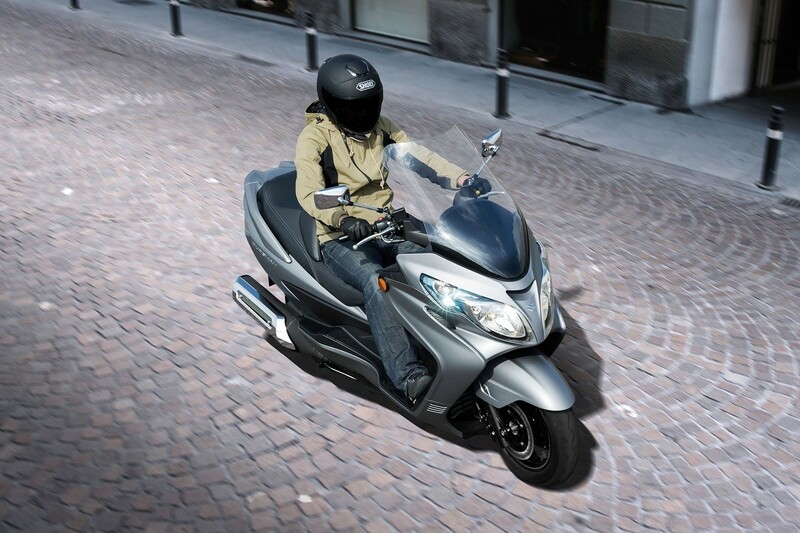 rear wheel has a 210 mm hydraulic disc brake for reliable control. Dash-mounted parking brake lever securely locks the rear wheel. Sculpted bodywork expresses flow and agility, with stylish contours that exhibit quality and performance. 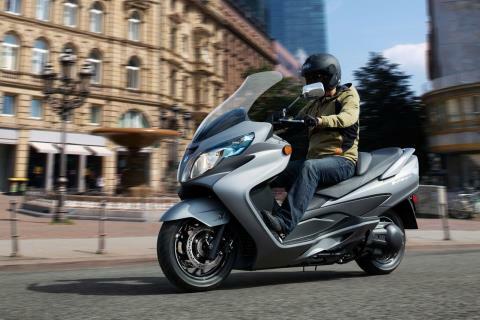 Abundant luggage space; huge 62 liter under-seat storage compartment, large enough for 2 full-face helmets, plus a smaller compartment for small personal items. Convenient switchable under-seat lights to illuminate the entire storage area. 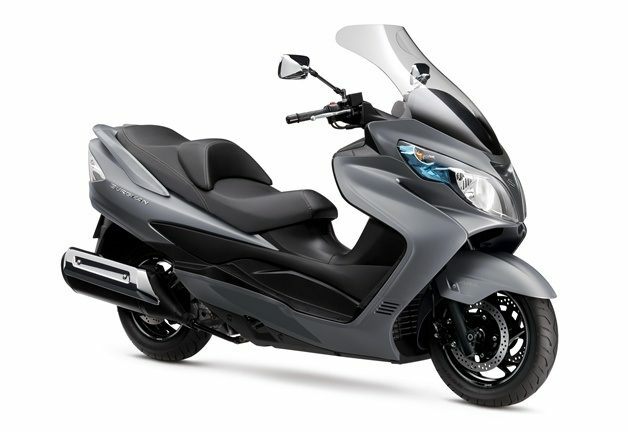 Front bodywork contains three covered storage compartments; a large 10 liter compartment with a convenient DC power outlet for charging electric devices on the fly, and two smaller compartments above it. Stepped dual seat for comfort and confidence. The rider’s backrest is adjustable in five 10 mm increments at the press of a lever. Open footboards allow the rider to comfortably move and support the scooter at stops and starts. Security gate allows a chain lock to be passed through the bodywork around the frame and then around an immovable object. The comprehensive and easy-to-read instrument cluster incorporates a speedometer, a tachometer, an odometer, twin tripmeters, a clock, and indicators for the ambient temperature, average fuel consumption, fuel level, and coolant temperature. Torque-rich, 400cc, 4-stroke, 1-cylinder, DOHC, fuel-injected engine produces polished performance. The generous 3.6 gal. fuel tank lets you rack up lots of miles fuel stops.